As the global media spotlight was dominated by trivial ‘selfies’, ludicrous signage and an unseemly scramble for historical alignment in South Africa, echoes of the Cold War in all its clumsiness were ringing out in Kiev. Ukraine has long been torn between East and West; indeed the ill fated Orange revolution played out along exactly those lines with Viktor Yushchenko cast as Western leaning democrat and Viktor Yanukovych clutching continuity and the Soviet infused East. Throw in a poisoning and it had all the makings of a Cold War power struggle. 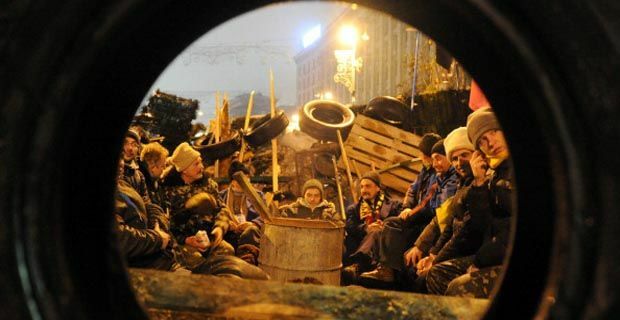 With Yushchenko’s promise engulfed in a mire of corruption, one might forgive Ukrainians for abandoning their belief in the power of protest to effect genuine change. But with a middle class hungry for the perceived benefits of European membership, and the determined survival instincts of Yanukovych manifesting themselves in yet another questionable election, the kindling was packed tightly and awaited only a spark to reignite; a spark that finally came with Yanukovych’s termination of glacial EU negotiations. He may be playing an abstruse negotiation game or this may be the implementation of a back room deal with Putin, but either way, it has spiralled out of control. Vladimir Putin has never been known for his subtlety, and his heavy handed use of energy supplies, economic extortion and cultural chest beating in the industrialised east has been in evidence since well before the Orange Revolution, reaching its’ apex in the extraordinary turning off of natural gas in 2006. Fighting a desperate action to retain a sphere of influence beyond Russia’s borders and a buffer state to confound European (and NATO) expansion, his battle to maintain Russian influence over Ukraine was both predictable and apparently effective. It seemed that his old school muscle had paid dividends. There were indeed protests back in Kiev, but history had dealt Yanukovych and Putin a very strong hand. All they had to do was nothing. Nelson Mandela’s death would dominate the headlines, it was -15 in Kiev and the intricacies of EU negotiations were hardly the most inspiring banner to rally a revolution around. It was perhaps more an urban, upwardly mobile fight than a burning question of injustice or identity. And then the police went in hard. Violence completely changed the dynamic and recast the nature of the protests and the depth of feeling running through them. Did they learn nothing from the Arab Spring? The regimes that emerged unscathed from their protests understood the power of nuance and cosmetic compromise in taking the sting out of volatility. They cast themselves as with the people and are now stronger than ever, with supposed constitutional changes limiting none of their power but bloodlessly crushing a potential revolution. Almost all of the old guard militarist Arab leaders, immersed in the bunker mentality of monolithic repression were toppled. With Bahrain and their Saudi uncle a notable exception, not least because of the sectarian dimension, the lesson seemed clear. Violence was an increasingly ineffective weapon and subverting revolution through basic popular diplomacy was the new medium of state control. It was a lesson in realpolitik from the Arab world that neither Putin nor Yanukovych seemed to have learned. Forget concessions even. Just don’t attack the protestors, because doing so can only galvanise them and bring the media spotlight skidding back from South Africa. Make the issue seem dry and complex. Align yourself vaguely with anyone and everyone. Tell those in favour of the EU that it is a negotiating tactic. Frame the story. One wonders how people so devoid of common sense or the lessons of history could possibly make it to positions of such power. Why wasn’t Putin phoning Yanukovych and urging him to keep his powder dry. This was no Orange Revolution. But now, it might become one. Not to be outdone the US has blundered into the fray with a withering condemnation of the violence. Apparently unconcerned with the outrageous hypocrisy of their statement when compared to their mealy mouthed dithering on Egypt, they seem equally blind to the likely effect on Vladimir Putin’s blood pressure. While there is no doubt that the US is deeply frustrated with Russian machinations on Syria and Iran, one would imagine that strategists playing the long game would forgo this chance for impetuous revenge and play at an altogether more nuanced level. With John Kerry’s deputy, Victoria Nuland, distributing biscuits theatrically to protestors, it seems as if the desire to put one over on Putin has impaired their strategic sense. This was supposed to be an EU matter wasn’t it? Surely leaving the EU to act as proxy for their interests would have been a far more effective plan, not least because the US condemning anyone for anything in the name of freedom usually backfires on them these days. Attempting to insert themselves and their war worn banner of freedom into the narrative of the Ukrainian protests seems set to create new divisions, muddy the goals and infuriate Putin, who will lose no time in plotting his own revenge. Yet again, knee jerk short termism in US foreign policy has reared its head. Putting idealism and the ‘right’ outcome for Ukraine entirely to one side, recent events call into question how competent any of the players are at serving their own interests. The architects of the break with Europe have paved the way for a protest to potentially grow into a revolution and undo all their machinations. The US seems incapable of the kind of subtle power politics they demonstrated in Iran recently, and the blundering strategies we are witnessing in Ukraine are uncomfortably redolent of the Cold War’s crudest urges. Let us just hope that the people of Ukraine find a way through the morass of intrigue, interest and incompetence. Revolution in Ukraine as president deposed. Will the country now split in two?